This post is way overdue. 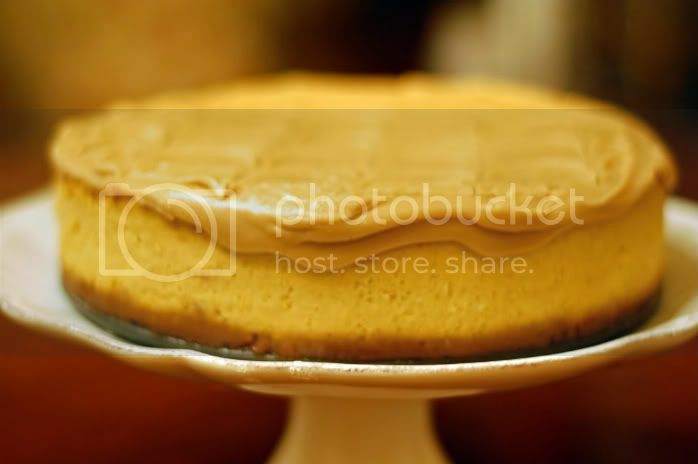 Believe it or not, this amazingly delicious pumpkin cheesecake was made for Thanksgiving. That's a clear indication how far behind I am, however, the salted cashew chocolate toffee below was from Thanksgiving as well. So, slowly but surely, I'm getting there. I make this cheesecake every year for Thanksgiving and it has become a staple dessert for years to come. I go for a slice of this before the pecan pie which says a whole lot about this cheesecake. The crust is crushed up gingersnap cookies followed by a creamy maple pumpkin filling and topped off with a brown sugar glaze. The crust to filling to glaze components are perfectly in sync for a blast of delicious flavors in each bite. This truly is my most favorite cheesecake out there and it can be made all Fall through the Winter---not just for Thanksgiving. Enjoy! 1. Preheat oven to 325 degrees F (165 degrees C). Grease and flour a 9 inch springform pan. 2. Using a fork, combine gingersnaps, hazelnuts, 3 tablespoons brown sugar and melted butter. Press mixture onto the bottom and two inches up the sides of the pan to form the crust. 3. With an electric mixer, beat cream cheese and brown sugar until light and fluffy. Stir in the pumpkin. Mix in the cream, maple syrup, cinnamon, allspice and vanilla. Beat in the eggs, one at a time, mixing until smooth. 4. Pour batter into prepared crust. Bake in the preheated oven for 90 minutes, or until center of cheesecake is set. Allow to cool in pan for 30 minutes then refrigerate overnight. how do you make the brown sugar glaze?